The use of advanced data visualization technology is heating up developers of business intelligence, and data analytics apps look to handle big data. Seeing is believing, they say, and a picture is worth a thousand words. Developers of business intelligence and data analytics applications are increasingly using advanced data visualization technology to handle huge volumes of data in a way that helps information workers better interpret analytical results. In today's fast-paced, "big data" world, static bar charts and pie charts just don't cut it, notes a recent report from Forrester Research, "The Forrester Wave: Advanced Data Visualization, Q3 2012." Increasingly businesses are demanding more dynamic, interactive methods and tools for line-of-business managers and information workers for viewing, understanding and acting on data analysis. "There are a lot of businesses that are being bombarded with data and they need to quickly turn that data into business decisions," said Steve Adams, managing director of the U.K. operations of Linalis, a Geneva, Switzerland-based IT services company that develops business intelligence solutions. And while most traditional business intelligence tools are geared toward either market analysts or a select few decision makers, advanced data visualization is seen as a way to make business analytics available to a wider audience. "It's about empowering the end-user to be more self-sufficient," said Dan Potter, IBM product marketing executive who manages Cognos Insight, a "data discovery" exploration and visualization tool IBM debuted in March. "Visualization technology is a big part of that." Advanced data visualization, he said, is "one of the fastest growing areas in business analytics." ADV "identifies trends and relationships in the data that are not always easy to spot," said Michael Corcoran, chief marketing officer at Information Builders. "I see a broad appeal for many business users who want access to these capabilities." Limitations inherent in older data presentation applications make it difficult for users to spot patterns and trends, according to the Forrester report. Often they can't fit more than a few thousand data points on a screen, for example, and are generally limited to a few dimensions or attributes, such as time, regions, products, etc. ADV systems can present information with many -- even dozens -- of dimensions or attributes. Some offer animated visualizations to show, say, changes in sales of a product over a period of time rather than requiring a user to click through a series of charts. Analytical results can be displayed in a three-dimensional graph, a series of "cockpit gauges," a heat map that uses varying colors to represent values or geospatial representations that overlay data on geographical maps. And, ADV tools are far more interactive. Users can visually query the data by manipulating portions of graphs or charts, the report said, by changing, for example, a dimension such as time to look at analytical results in different timeframes. Or, they can "lasso" a subset of the data to drill down into one segment of the results. ADV tools are often linked to data sources so that analytical results are dynamically updated as data changes -- a critical feature in such industries as financial services and equities trading in which users are analyzing constant streams of information. The need for these new-generation data visualization tools is being driven by the explosion of "big data" -- the rapidly growing volumes and variety of data businesses are collecting today from not just traditional transactional systems but from other sources such as social networks like Twitter and Facebook. Also fueling the demand for ADV are powerful, low-cost blade servers and software like Hadoop that make it easier to collect and process lots of data but don't by themselves make it easier for people to understand analytical results. Another factor is the growing use of in-memory database technology, such as SAP's HANA appliance and the Oracle Exalytics Machine, which also accelerate data processing. And that demand is fueling opportunities for solution providers that work with business intelligence technologies. 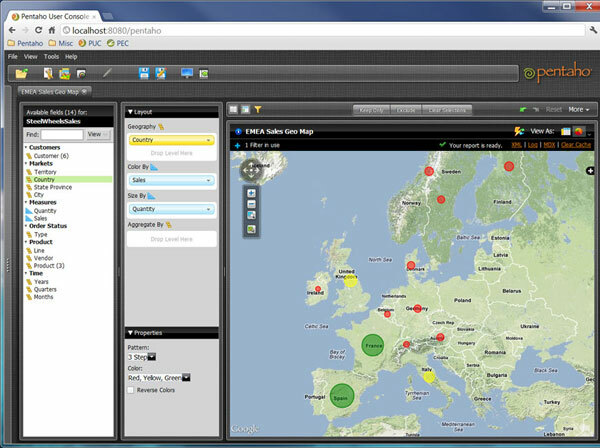 Pentaho's business analytics software offers geomapping representation capabilities, such as this European sales analysis map (click image for full-sized view). Linalis, for example, develops business intelligence solutions that include business analytics and data visualization software from Pentaho. Customers include public sector organizations and non-governmental organizations that require business analytics with geo-mapping capabilities, and financial trading firms that need the ability to quickly identify, say, trends in equity prices, Linalis' Adams said. Until recently few customers were aware of advanced data visualization and its benefits. But that's changing. "It's becoming more and more a part of the pre-sales discussion," Adams said, adding that data visualization is a factor in as much as 50 percent of Linalis' recent customer wins. Forty percent of business analytics spending today is being driven by line-of-business managers, not IT management, said IBM's Potter. That means selling business analytics software requires vertical industry expertise to develop domain-specific analytical models, metrics and key performance indicators. "The deep industry expertise [channel partners] provide is really critical," Potter said. "I really believe that the dropping cost of [computer] technology is going to revolutionize the way small and midsize businesses can take advantage of these [ADV] capabilities," added Scott Van Valkenburgh, senior director of alliances at business analytics leader SAS. And, many of those sales will be through the channel, he said. Adaptive Solutions, a Kinnelon, N.J.-based developer of enterprise information management solutions, has found that selling IBM's Cognos Insight software helps it win new customers and expand the solution provider's footprint within existing customer businesses. Case in point is one Adaptive Solutions customer that considered deploying an enterprise-wide BI system but then decided to initially limit it to the corporate headquarters, said Wayne Milano, managing partner at Adaptive Solutions. Adaptive, in a pilot project, implemented Cognos Insight on a standalone basis for employees outside of the corporate office to introduce them to business analytics. They can be integrated with a corporate BI system when it's built out, Milano said. The Forrester Research report identified Tableau Software, IBM, Information Builders, SAS, SAP, Tibco and Oracle as the ADV market leaders based on the richness of their ADV functionality, product strategy and market presence. Microsoft, MicroStrategy, Actuate, QlikTech, SpagoBI and Panorama Software were tagged as "strong performers," and Jaspersoft and Pentaho were cited as worthy options, offering "60 percent to 80 percent of the ADV functionality at a fraction of the cost" of competing products. In June, Pentaho scored a significant victory when Dell inked a deal to resell Pentaho's business analytics software, including its ADV capabilities, as part of the Dell Apache Hadoop Solution. IBM's previously mentioned Cognos Insight software is based on the company's in-memory OLAP TM1 engine. One of the product's advantages is its ability to tap into other IBM technologies, including the SPSS Modeler advanced analytics software, the Forrester report said. Forrester cited Tableau's VizQL software as a leading ADV product that can be used in conjunction with other BI platforms that lack ADV capabilities. Tibco's Spotfire Analytics software can be used in a similar fashion. Information Builders has made advanced data visualization part of its WebFocus business intelligence software for years, Information Builders' Corcoran said. The upcoming WebFocus 8, expected to ship early in the fourth quarter, will include a redesigned metadata architecture that ISV partners can tap into to build software-as-a-service applications with ADV capabilities. SAP's BusinessObjects Explorer and Visual Analytics offerings get a major boost from the vendor's HANA technology, according to Forrester. "We've also been focused on making the solutions easy to try and easy to buy," said Jayne Landry, SAP global vice president for route to market products. John Wilkinson, vice president of analytics for SAP's global ecosystems and channels, added that business analytics for midsize businesses is one of the fastest growing segments of the business intelligence market. Business analytics powerhouse SAS is a major player in ADV with its SAS JMP desktop visualization and analysis application and its advanced SAS Visual Analytics offering. And Oracle's Exalytics in-memory computing system provides a boost to the ADV capabilities in its Oracle Business Intelligence Enterprise Edition.